I remember the hot summer days in Amsterdam when I was a little girl and my mom and I would take the train to the beach. It was so much fun to play (almost) naked in the sand, run around and collect seashells. I guess not much has changed since then! The water was freezing cold and because it’s the north sea, it never really warms up. Either way I loved swimming around, trying not to bump into any jellyfish. At the end of the day I would get a soft serve ice cream cone which I had been looking forward to all day long. Back on the train which was packed with red-tanned people going back to Amsterdam and surroundings, my skin would start to feel very warm and a bit tight. I’d still notice I’d been outside in the sun all day long. My mom had a remedy for that. She would put cucumber peels on her and my face and anywhere where the body needed it. The rest of the cucumber would go into the salad that she made for dinner. The sensation of having cold cucumber on your skin was amazing. The coolness and juiciness were quickly absorbed by my skin and provided much needed relief. Cucumbers contain as much as 95% water, which is why they are so hydrating. They are also rich in antioxidants such as vitamin C and beta-carotene and the anti-inflammatory flavonol. Perfect for skin that needs some extra hydration and care. You can read more about the amazing health benefits of cucumber here. I like using them in this simple cucumber aloe vera lotion with coconut milk. You only need 3 ingredients and it literally takes a few minutes to make. Aloe Vera is a true miracle plant that has been used throughout history for both internal and external uses. It’s a popular ingredient in skincare as it deeply moisturizes the skin, stimulates the growth of new cells, has anti-inflammatory properties and is rich in antioxidants. It also speeds up the healing process of damaged skin and is very soothing for skin conditions such as eczema, acne, psoriasis and sunburnt skin. 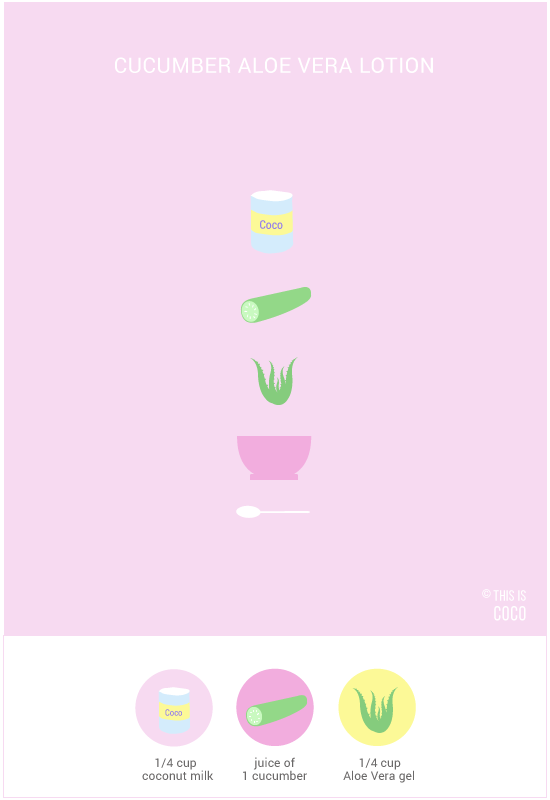 I use Aloe Vera a lot in my DIY recipes such as in this hair mask, makeup remover, moisturizer and cuticle cream. Coconut milk is the white liquid made from grated coconut meat. It’s very moisturizing and provides the skin with fatty acids, vitamins and minerals. It also helps maintain skin elasticity and has anti-aging properties. 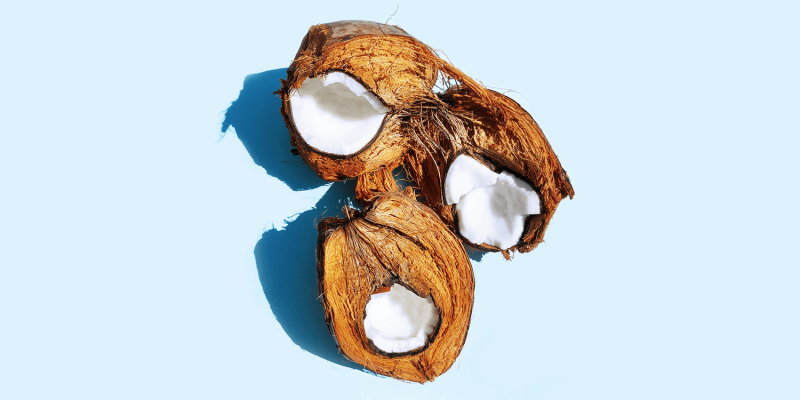 If you’re using canned coconut milk, choose one that is as natural as possible. You can also make your own coconut milk. The peel of the cucumber has the largest amount of nutrients, but you should wash it properly. I like to use an organic vegetable wash for it or soak it for 10 minutes in a bowl with water and baking soda and then scrub it clean. Blend the cucumber and strain it through a sieve to separate the liquid. I use fresh aloe vera gel from my own plants, but you can also buy Aloe Vera gel. Gently massage the cucumber aloe vera coconut milk lotion into your skin. For an extra cooling effect you can put all the ingredients in the refrigerator for a few hours prior to preparing the lotion. Aloe vera can leave stains on your clothes, so it’s best to rinse off the lotion before you put on your clothes!